Sometimes having a flashlight comes in handy, but can be difficult when defending yourself with a Nerf blaster since most blasters require two hands to use. The solution? 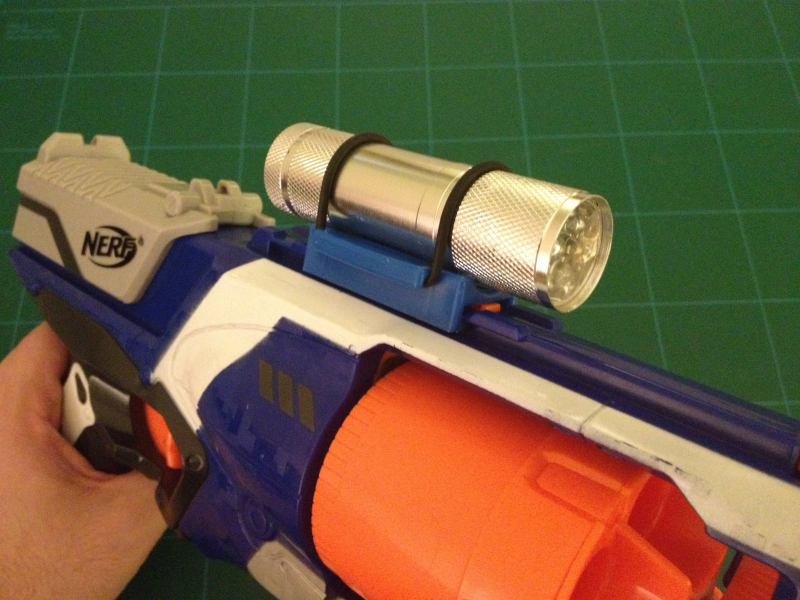 Well, Nerf’s tactical lights can hardly be classified as flashlights, as they do little to actually illuminate a room. Also their size and weight usually stress the bracket that holds them to the tactical rail to the point of failure. Something homemade or something aftermarket are the only real options. This is where the NH1 Accessory Holder by NerfTech comes in. What began as a Kicksarter project has bloomed into an awesome little company that solves a problem for Nerf enthusiasts like me. On the website you can purchase flashlights, laser pointers, and replacement o-rings as well, but the star of the show is the NH1. With a price point well under $10, (I paid $8 before shipping,) this little gadget isn’t going to break the bank and you definitely get your money’s worth. What store did you pick this up at? 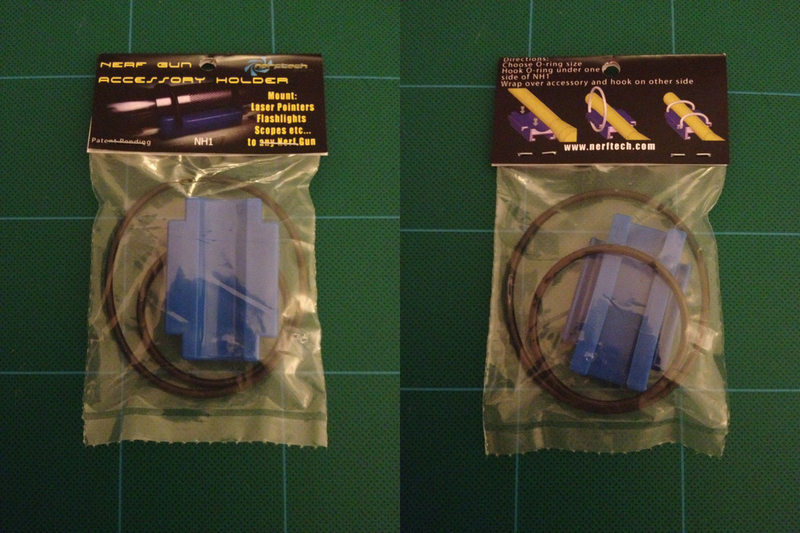 When I first saw the packaging for the NH1 Accessory Holder from NerfTech, I have to say I was pretty impressed. It arrived in a heat sealed plastic bag with a coated paper label stapled to it. If the paper had been card stock and had a UPC code on it, I would have assumed that there are hobby stores selling these somewhere. As it is, it looks really professional. I actually waited a while after I took the pictures just because I didn’t want to wreck the packaging. The package contains the NH1 itself and two different sized o-rings. I personally love that it utilizes o-rings for adjustment. A quick trip to the nearest hardware store and you can mount anything to it, (or replace a burned out o-ring) for mere pennies. The main difference between the NH1 and everything else I’ve seen out there, is that this is made as an injection-molded plastic part instead of a 3D printed one. This makes the NH1 one of the strongest aftermarket parts that you are going to find. Every homemade solution I have come up with to mount a flashlight to a blaster has been flawed to say the least; It’s either too big, doesn’t feel secure, and/or just looks ugly as sin. The NH1 handles all of those problems with ease. I picked up the cheapest keychain flashlights I could find for this review. I need to be able to see in a dark room, not help aircraft land. (Your needs may vary.) 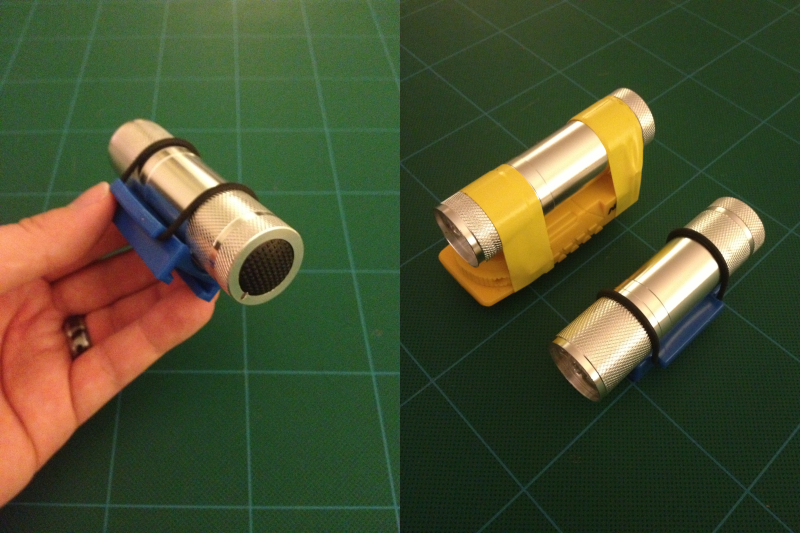 Attaching the flashlight to my StrongArm couldn’t have been easier. I would recommend attaching the NH1 to the blaster and then attaching the flashlight afterwards but reversing the order only makes it slightly more difficult to attach. Then, just like the back of the package instructs, pick the o-ring that will fit the best and hook it over the accessory and over the slots on both sides. For my flashlight, the smaller o-ring fit perfectly. The NH1 was a really snug fit at first, but loosens up a bit after a while. This is both good and bad. If you don’t know what blaster you want to use it on, you may have some difficulty sliding it off the first couple of times. At first I was worried that it might loosen up too much over time, but it looks like the NH1 has been designed with this in mind. I’m seriously thinking that the flashlight will fail me way before the NH1 does. I have yet to find a blaster that this doesn’t fit on. There are a couple of blasters that the NH1 makes priming more difficult, but I would blame the blaster design way before the NH1. For example, It was a bad idea for the Maverick, Recon, and Retaliator to have a tactical rail on the priming mechanism in the first place, in my opinion. The only thing I can think of to make this product any better is a choice of colors. A white one would look cool on any of the new Elite blasters or the new Rebelle blasters, and a matching orange would look amazing on the Elites or even the new Zombie Strike HammerShot. To give it a good trial run, I attached it to my Elite Alpha Trooper, and used it during two games at this years GenCon gaming convention. The rooms were pitch black. I took point. We finished both missions with no casualties. It worked perfectly, and looked cool while doing it. I had no fear of the NH1 falling off the tactical rail, the o-ring held the flashlight in place with no issues, and with it being molded plastic over 3D printed, I knew that it was the last thing that would structurally fail if it got dropped or bashed in any way. 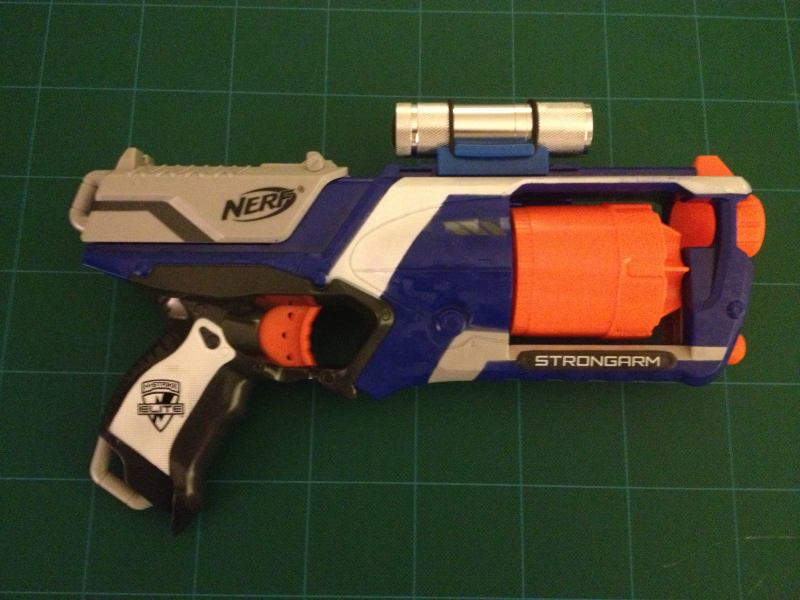 Don’t forget, this will easily mount almost anything cylindrical in shape to a Nerf blaster with a tactical rail. Of course there are limitations. No matter how big an o-ring you can find, I wouldn’t recommend attaching a 2 liter of soda to a Nerf Reflex and then leaping headlong into battle with it. But, if you have a cool scope, laser pointer, flashlight or anything else you you want to mount on your favorite blaster, you might want to consider the NH1 as an option. 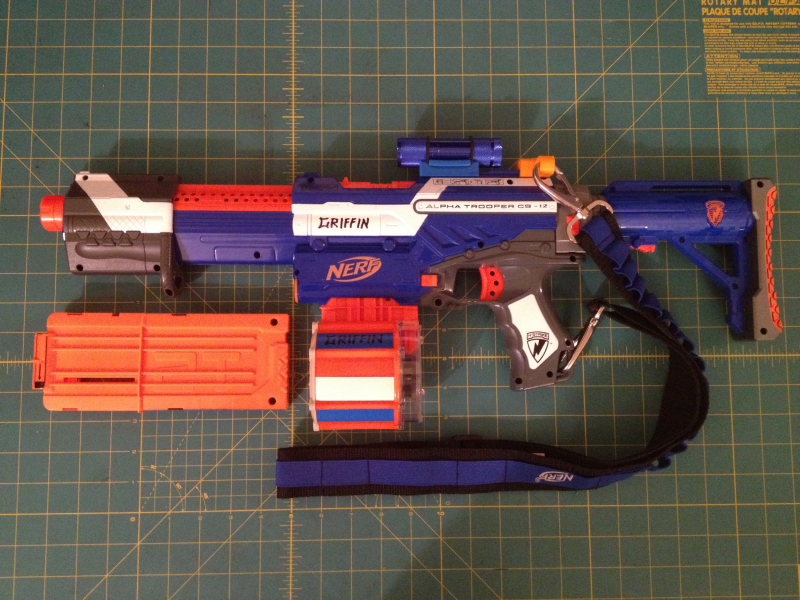 Check them out over at NerfTech and/or their Facebook page. This is my first blog, and I’m a little nervous, but hopefully this will be helpful and informative enough for you to keep coming back for more updates and reviews. I’m planning to have several different sections: News, Office Arsenal, Executive Arsenal, The Cage, Pay-To-Win, & Boffer Corner. News is pretty self-explanatory. I’ll be passing on anything noteworthy that I happen across. I don’t have a finger on the pulse of the Nerf Community nor will I be posting everything that I happen across. 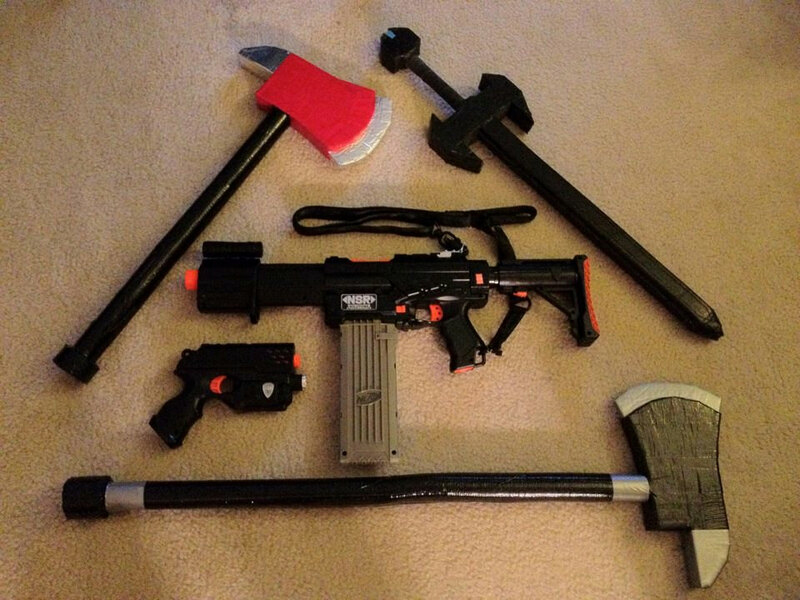 So, feel free to check out the other Nerf bloggers out there. Office Arsenal is to help those looking for the most cost effective blasters (Nerf as well as other brands) for cubical defense. To assist, I’ll be reviewing every blaster that I can find under $20 or so. Executive Arsenal is for those with a bit more spending cash. I’ll be reviewing every blaster that I happen across (that I can afford) that is over $20. The Cage is not a link to the pilot episode of Star Trek, nor it is a link to that nice Coppola boy‘s fan page. It’s the section to look at for any blaster accessories as well as melee, and throwing-styled Nerf weapons that I happen across. Pay-To-Win is where I will be reviewing companies or individuals that make aftermarket parts or do commission mods for foam blasters. Boffer Corner is a section where I plan to show how to make your own foam melee (also sometimes known as boffer or LARP) weapons.